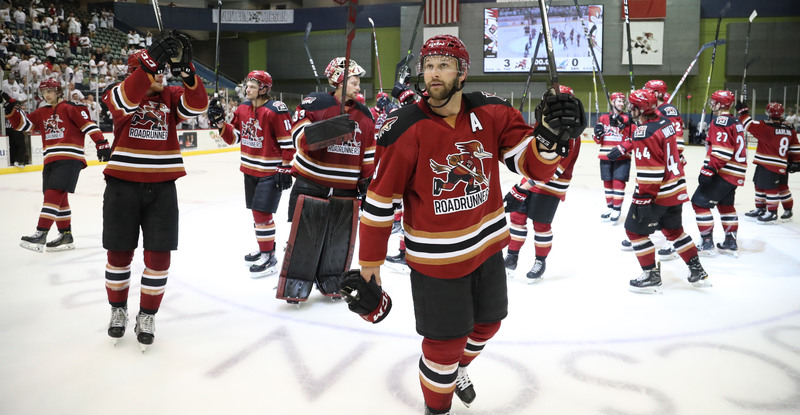 A memorable and undoubtedly successful season came to an end for the Roadrunners last Friday night, it all coming to a close in a flash in overtime of Game 5 of the team’s Pacific Division Finals series. Finishing the regular season with a 42-20-5-1 record, an incredible campaign that included a Pacific Division title and a Western Conference regular season championship, the team exceeded many of the expectations it held heading into the year. “I think we accomplished a lot of the things that we set out to from day one,” Head Coach Mike Van Ryn said on Monday as the players filed out for the summer. During the first half of the season, the duo of Dylan Strome and Nick Merkley was virtually unstoppable. Both players were wildly successful out of the gates during their first professional season out of junior, averaging more than a point-per-game in Roadrunners uniforms. Merkley, despite his year being cut short due to a season-ending injury suffered in late March, totaled 39 points (18G, 21A) in 38 games played, including 13 multi-point performances. While in Tucson, Strome was a constant fixture in Tucson’s high-powered offensive approach. He finished the regular season with 53 points (22G, 31A) in 50 games played, and finished tied for the team-lead in playoff scoring with eight points (3G, 5A). Strome was recognized with four awards during the year: Player of the Week honors on two occasions, once for the period ending October 29, and shortly after for the period ending November 26. He was named the AHL’s Rookie of the Month in November, and at the conclusion of the regular season, was named to the league’s All-Rookie Team. The year saw 14 players who donned a Roadrunners jersey earn an NHL recall to the Arizona Coyotes, 10 of which played live action at the sport’s highest level on a national stage. The 10 names that dressed for the Coyotes upon their promotion combined for 80 games played and 17 points (8G, 9A) scored. Six players: Adin Hill, Mario Kempe, Dakota Mermis, Kyle Capobianco, Nick Merkley, and Trevor Murphy made their NHL debuts. Hill earned his first-ever NHL win, while Kempe and Murphy registered their first NHL points. The team was heavily represented at the 2018 AHL All-Star Classic in Utica, New York on January 28 & 29, with rookies Dylan Strome, Kyle Capobianco, and Nick Merkley selected to participate in the skills competition and the 3-on-3 challenge. Joining them was Head Coach Mike Van Ryn, who led the Pacific Division, and Coyotes Pro Scout Craig Cunningham, who served as an honorary captain. Strome, Capobianco, and Merkley combined to appear in four events during the skills competition, and totaled eight goals and 17 points during the 3-on-3 challenge. The Roadrunners were the only team other than the Manitoba Moose to have three players on the 2018 AHL All-Star Classic roster. While boasting one of the most productive offenses in the league, the Roadrunners were further supported by arguably the AHL’s best goaltending tandem in Adin Hill and Hunter Miska. Hill finished the regular season with 19 wins and earned his first-ever NHL victory on March 13. Miska’s 22 wins were the second-highest total in the league among rookie goaltenders. Fierce in opposing building this season, the Roadrunners earned more than half of their regular season wins on the road, pocketing 51 of their 90 standings’ points in the process. With a final mark of 24-7-2-1 away from Tucson Arena, translating into a .750 points percentage, the Roadrunners were the best road team in the Western Conference, and the second-best in the AHL, behind only the Toronto Marlies. In extending to overtime on 17 occasions during the regular season, the Roadrunners came away with victories 11 times, winning 10 games in the extra frame, the second most among all teams in the league. On March 31, the Roadrunners became the first team in the Western Conference to secure a Calder Cup playoff berth, clinching a postseason spot for the first time in franchise history. 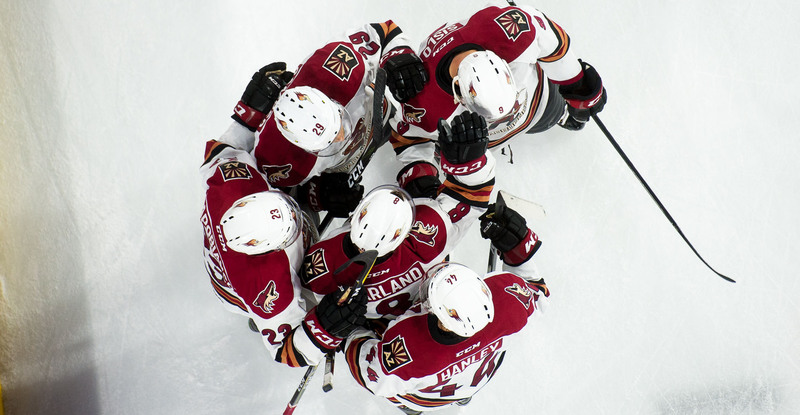 In the first round, a best-of-five Pacific Division Semifinals series against the San Jose Barracuda, the Roadrunners advanced in four games, becoming the first Coyotes American Hockey League affiliate to win a playoff series since the Springfield Falcons in 2003. Adin Hill capped off the first round with consecutive playoff shutouts, becoming the first goaltender to achieve such a feat since Petr Mrazek in 2013 with the Grand Rapids Griffins. They would falter in the Pacific Division Finals, dropping their best-of-seven bout to the Texas Stars in five games, officially ending their season. Dylan Strome, Lawson Crouse, and Carter Camper each finished the team’s nine-game playoff stretch with eight points each, tied for the team lead. Of the players to spend the entire season with the organization, 10 registered 20 or more points during the regular season. Mike Sislo, who finished the campaign with 47 points, set a new team record with points in nine consecutive games from January 10-27. Rookies Lane Pederson, 26 points, and Kyle Capobianco, 30 points, each produced remarkably, while Mario Kempe chipped in with a solid total of 37 in his first full season of pro hockey in North America. Forwards Michael Bunting and Conor Garland saw their point totals drastically increase, Bunting finishing the year with 43 points, a +15 boost from his 2016-17 total, and Garland with 27, a +13 gain from the team's inaugural season.